Some yachts occasionally offer bookings by the cabin. This means that you will have your own private cabin but share the yacht with others. It’s a great way to meet people with similar interests and make new friends. 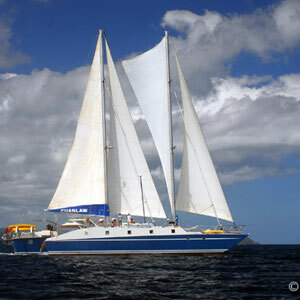 Cuan Law, a 105’ catamaran, is the largest sailing trimaran in the world and will accommodate 20 people in 10 air-conditioned Double or Twin cabins with ensuite heads/showers. There are 8 crew of which at least one is a SCUBA dive instructor. SCUBA diving offered from Resort Course to full certification. Lots of water toys including Hobie Cats and kayaks.